Ah... the memories of summer as a child, long grass, bright flowers, secret dens, sunny days, butterflies and the heavy drone of bumblebees. There as been a lot of interest in bumblebees this year - BBC, RSPB, BRISC, Rothamstead - because those species found in open country, such as flower meadows, heaths, coasts, etc, have declined significantly over recent years (see Williams, for example). 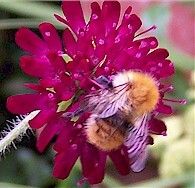 Prompted by this activity I decided to take a look at the bumblebees in my garden. Just 1/2 hour demonstrated to me how tricky this can be - they move, they're variable, their colours wear off and there are similar looking insects, especially cuckoo bees and hoverflies. Although, several of the interest groups have produced handy guides, they tend to be unsuitable in some way - restricted geography, only common species, etc - and the supporting text is not summarised for easy field use. My field guide was simply too clumsy. So, I decided to produce my own crib sheet, which you can download if you’d like to try it. Of course I am not an expert. The information used to derive the crib sheet was obtained from various sources on the web and various guides and articles, but any mistakes are my own. When I went looking for bumblebees in the garden almost the first I saw was actually a cuckoo bumblebee, Psithyrus vestalis, and there were lots of them! Elsewhere I found the hoverfly bumblebee mimic, Volucella bombylans. So I though a second crib sheet for bumblebee mimics would be useful. You can also follow the links to some good websites for further information on cuckoo bumblebees, solitary bees, hoverflies and bee-flies. Clematis vitalba decks out the winter hedgerows and woodland edges in some parts of the country with silvery seed heads. Not to everyone's taste but an interesting plant nonetheless. This is an article I was invited to write for British Clematis Society magazine. Another article for the British Clematis Society magazine. This one describes the mechanisms by which plants climb, focussing on the twining leaflet stalks of Clematis. The White-winged Snowfinch is a sparrow that spends its whole life in alpine country at high altitude. It does not descend even in adverse weather. Here we explore how the snowfinch, and other small birds that choose not to migrate, survive the cold. Unlike birds, plants cannot fly off to sunny climes, find a sheltered bolt hole, huddle together or heat themselves up to beat the cold, yet they can prosper in very harsh environments where cold stress during the winter is very intense. So how do they do it? We first take a look at ice and icey weather before looking at the tricks plants use to overcome it.